An industry-wide shift to advanced metering infrastructure (AMI) has been a boon for the utilities industry, allowing providers to handle peak-load conditions and meet demand fluctuations in real time. What’s more, corresponding technologies like IoT and digital twins have vastly improved maintenance efficiency while reducing total operational costs. Overall, AMI has been a huge win for the sector as a whole. One downside? Anti-fraud technology has failed to keep pace with the rate of infrastructure change, leaving these automated systems highly susceptible to theft as a result. Around the world, the numbers speak for themselves. In Canada, B.C. hydro has seen electricity theft increase from 500 GWh in 2006 to 850 GWh today. Developing countries, like Brazil, have to contend with the fact that 1/5 of all generated electricity is stolen. In the US, $6 billion worth of electricity is lost to piracy every year, making energy the third most stolen good in the country (credit card information and cars rank 1 and 2). All told, energy theft accounts for almost $100 billion in losses each year around the globe. That’s a terrible number for energy producers, but an even worse statistic for consumers, who end up bearing the brunt of those costs. 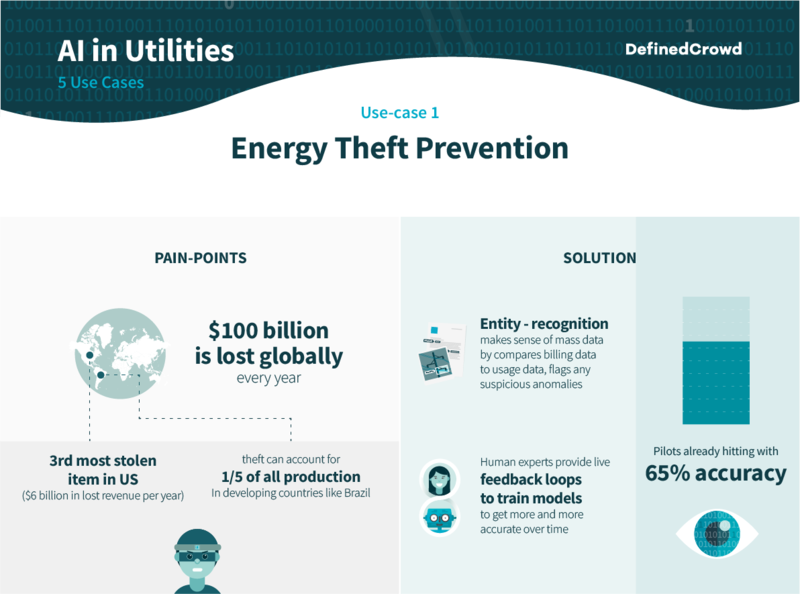 Artificial intelligence and machine learning technologies can combat energy piracy by enabling utilities providers to leverage the vast data sets produced through AMI upgrades. Pattern-detection models equipped with entity-recognition capabilities can scan individual customer profiles and flag suspicious discrepancies between billing and usage data. In fact, automated theft-prevention pilots are already making real headway here. One such project in Brazil can accurately pick out fraud at a 65% hit rate, which outpaces similar tools on the market. Thanks to AI, soon enough, energy thieves will have nowhere left to hide. Building out individual consumer profiles and keeping tabs on long-term behavior doesn’t just allow utilities companies to flag potential bad actors, it also opens up opportunities to identify, reward, and retain legitimate consumers, while informing strategic initiatives to grow a company’s overall customer base. Sentiment analysis models can produce both macro-level analysis (sifting through social media postings and online reviews) and micro-level insights (keeping tabs on individual customer interactions with customer-service representatives and virtual agents) that allow utilities providers to better serve targeted marketing campaigns to specific geographical locales and individual customers. Who’s at risk of churning? Who may be looking to upgrade their services? These are all questions AI can help answer. 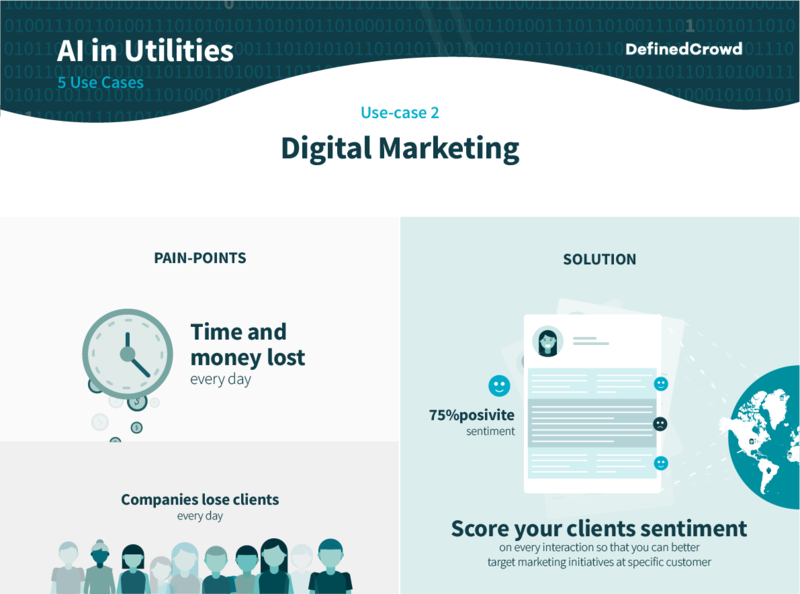 Click here for an infographic with all the 5 Use Cases. As digital technologies lower barriers to entry in just about every sector, asset-intensive businesses, like utilities, increasingly face challenges from new competition. With a consumer base spoiled for choice, customer-service capabilities and consumer-engagement initiatives have become all the more critical to long-term success. It’s no surprise that in Gartner’s “2019 CIO and CEO Agenda: A Utilities Perspective,” industry decision makers ranked “Customer Experience” as a top business priority for 2019. We’ve spoken at length about how chatbots can meet growing customer expectations saving companies time and money today, while setting the foundations for one-to-one communication channels down the line. 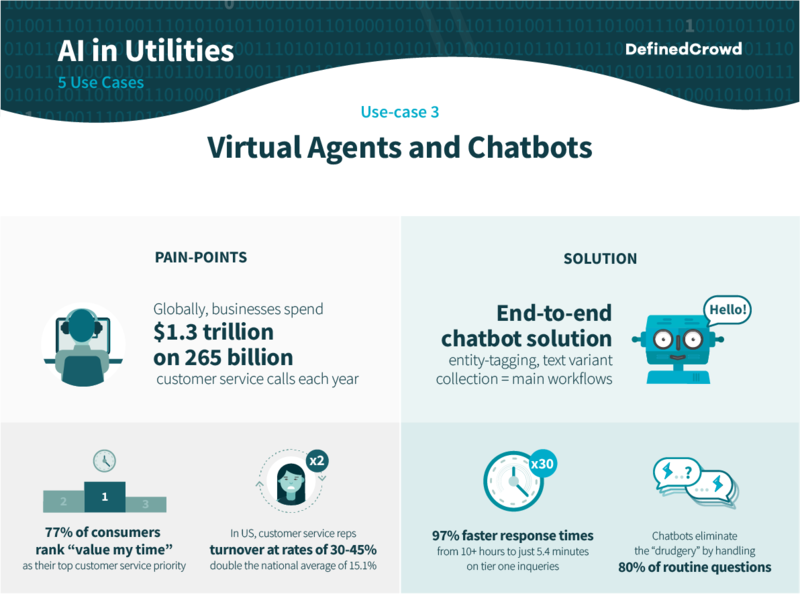 Utilities providers can draw inspiration from cutting-edge chatbots in other sectors, who do much more than regurgitate store locations and opening hours. Bank of America’s Erica helps customers understand their financial habits through animated spending paths, while Shell’s virtual avatars Emily and Ethan use Natural Language Processing to assist customers in finding specific goods in massive product databases. Utilities chatbots could help customers track their energy usage, provide useful pointers on increasing efficiency and, through product marketing partnerships with appliance makers, even offer recommendations for energy efficient appliance upgrades while projecting the long-term savings resulting from their installation. A) Notify technicians of minor issues (think a loose screw on a wind turbine) before those issues compound into major costs (think that loose screw leading to permanent damage on the turbine’s rotor blades). B) Analyze mass data sets from IoT-enabled infrastructure and accurately predict the likelihood that any particular asset will need to be replaced/repaired in the near to mid-term. The potential benefits here are enormous. Companies like Duke energy are already saving tens of millions of dollars through early detection of dips in asset performance, which allows them to nip minor issues in the bud before they get a chance to snowball. 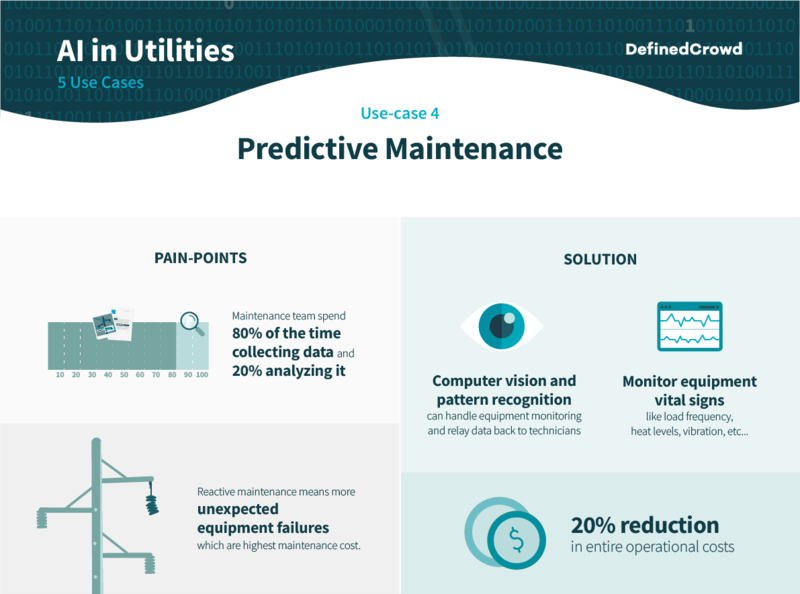 As the technology becomes more advanced, predictive maintenance will solve other industry pain-points too, such as redundancies in backup infrastructure purchases. Click here to discover how DefinedCrowd’s data expertise puts EDP on the path to predictive maintenance. At DefinedCrowd, we’re proud to have worked with visionary companies like EDP, who are leveraging expertly-annotated computer vision training data to implement predictive maintenance practices. For more, check out our case study linked above. Even with advanced document management systems in place, information workers (lawyers, paralegals, accountants, and compliance officers) still waste 10% of their time chasing down improperly filed documents, or recreating lost files altogether. 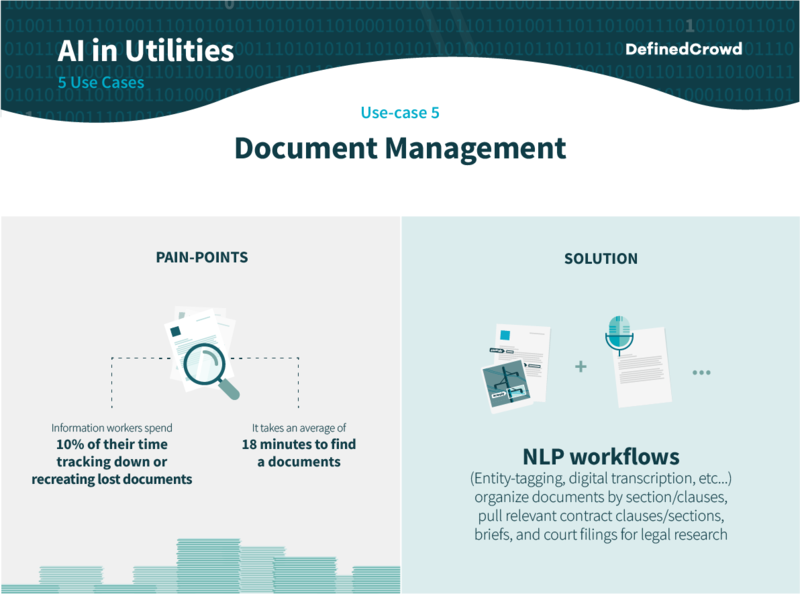 In the utilities sector, document management issues are often compounded by the vast number of subcontractors and independent distributors present in the field, all of whom bring their own unique invoicing and documentation procedures into the fray. It’s not unheard of for invoicing and other record keeping to be delivered in hand-written form at times, particularly in rural areas. NLP models capable of entity recognition, document segmentation, and digital transcription can order the chaos by digitizing hand-written documents and segmenting contracts and invoices into individual sections and clauses. From day one, these capabilities can exponentially improve contract organization, and give those information workers back their lost time. Down the line, these models can also assist with contract creation and negotiation by executing the legal research grunt work that arms teams with provisions, briefs, and court filings relevant to specific contract disputes.